USC President C.L. Max Nikias. THE PRESIDENT OF a top California university resigned in the wake of a growing scandal over a former campus gynecologist who stands accused of sexually abusing thousands of students over a period of decades. C.L. 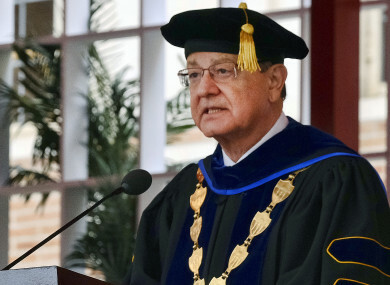 Max Nikias’ departure was announced in a letter by the board of trustees as the University of Southern California was facing multiple new lawsuits Friday over its alleged failure to act against the physician despite repeated complaints. The women allege that George Tyndall, who left the university last year, used his position to abuse them repeatedly, conducting improper examinations and groping their breasts. Rick J. Caruso, the board’s chairman, wrote that it had “agreed to begin an orderly transition and commence the process of selecting a new president”. “We have heard the message that something is broken and that urgent and profound actions are needed,” he said. The decision followed a call by two hundred professors demanding Nikias’ resignation. Two class actions meanwhile were submitted at the Los Angeles Superior Court “on behalf of thousands of female students” who attended the school in Los Angeles and were allegedly sexually abused and illicitly photographed by Tyndall. The complaints were filed by a team including Howard Janet, the lawyer who spearheaded a $190-million suit in 2014 against Baltimore’s Johns Hopkins Hospital and its physician Nikita Levy. Meanwhile, six former students were added to an existing lawsuit alleging that the university received complaints dating back to the early 1990s, but deliberately concealed Tyndall’s abuse. “Sadly, the university and its board of trustees have not taken the necessary steps to determine who was responsible and hold them accountable,” said John Manly, a lawyer for Jane Does 5-10. Email “US university president resigns as campus gynecologist accused of sexually abusing thousands of students ”. Feedback on “US university president resigns as campus gynecologist accused of sexually abusing thousands of students ”.